(WSB-ERO/SN/Leusden) – “The Art of Recognition” was the main theme of the third meeting of the Recognition of Learning in Scouting (ROLIS) Project in Slovenia from 6 to 8 June 2012. 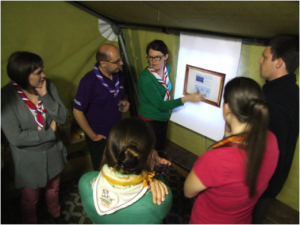 The event, which was supported by the European Scout Region, brought together Scout Leaders from eight National Scout Organisations (NSOs) from across the European Region of the World Organization of the Scout Movement (WOSM) who spent three busy days discussing various aspects of the art of recognition. Day one saw the participants exhibit results of the individual projects they had undertaken in the framework of the ROLIS project so far. Like in a high street art gallery pieces of art were on display and visitors could chat with the ‘artists’ during the ‘vernissage’. One the second day, the group work together to visualise the process that had lead to the results of the projects exhibited the previous day. This offered the project team and participants a welcome possibility to look back at how they had come to where they were now. The overview of projects included an inspirational presentation by Ross Donald, Educational Links officer of The Scout Association (Scouts Scotland), about his association’s involvement in the introduction of the recognition of Scouting skills in school curricula in Scotland. In another presentation, the group was able to see the way the simplified “competence rose” of Scouting Nederland worked in practice. This was in fact inspired by similar work initiated by a project team of Corpo Nacional de Escutas, one of the National Scout Associations (NSAs) in Portugal. Last but not least participants were introduced to the Soft Skills Project of Les Scouts and Scouts en Gidsen Vlaanderen, two National Scout Associations in Belgium. This particular project was in fact well advanced and a specially developed on-line tool for volunteers to test their competences and get practical advice to help them in their professional career. On the final day of the weekend, the participants “dreamed” about the future of their project. Where would their project be in one year, where in five years? And if whether there were associations, which were currently participating in the ROLIS project, with whom they would like to cooperate more closely. “All in all, a lot of progress has been made on the topic of ROLIS in the different associations”, summarised Tom Kievit, from the coordinating project team of Scouting Nederland, adding that “the cooperation in the project has also inspired participants and has helped them to exchange and cooperate, as well as to share knowledge and improve their particular projects”. Find out more about ROLIS and participating projects on the internet.